The beautiful Coral Hairstreak is one of the gems of our butterfly fauna. It is a bit unusual among the hairstreaks in not inhabiting woodlands, like the Banded or Hickory, but rather shrubby, second-growth areas where its main host, Black Cherry (Prunus serotina), flourishes. Like many butterflies, Coral Hairstreak needs both open areas for nectar (milkweeds are favorites), and re-growing woods for its larval host. Thaddeus W. Harris had one specimen of “this fine butterfly,” taken on the Cape at Sandwich, Massachusetts in 1833, by a Mr. John Bethune (Index; 1862: 278). This is the earliest Massachusetts specimen; Scudder (1889: 813) lists several more reports and specimens, from Williamstown, Springfield, Mt. Tom, Holyoke Range, Amherst, Belchertown, and Leverett in western Massachusetts, from “several localities in the vicinity of Boston “ (where it was ‘very rare’), and from Cape Cod at Hyannis, Sandwich, Eastham, and Provincetown. We may infer that Coral Hairstreak was fairly common on Cape Cod in the late 1800's, and in the Connecticut River valley, but had become less common around Boston. In the Harvard Museum of Comparative Zoology (MCZ) there are early specimens of Coral Hairstreak from Belchertown and North Leverett in western Massachusetts, collected by Frank Headley Sprague in 1878. All other specimens before 1900 come from eastern Massachusetts: Milton (1895, Sprague, MCZ), Lexington (1897, C. Bullard, MCZ), Weymouth (1900, MCZ), Wellesley (1899, Dentons, MCZ), and especially Wollaston (1883, 1895, 1896, Sprague, MCZ and BU), which is now part of highly developed Quincy. Lexington, Weymouth and Wollaston are towns where this hairstreak would be very difficult to find today. Other early specimens come from Malden (1902, BU), Saugus (1906, BU), Newton (c. 1895, Faxon, MCZ), and in central Massachusetts, Framingham (1907, 1910, C. A. Frost, BU). Coral Hairstreak continued to be somewhat common on Cape Cod in the early 20th century. There are 1919 specimens from Wellfleet (C. W. Johnson, BU) and from Woods Hole (W. T. M. Forbes, Cornell). In the 1920's Charles J. Paine Jr. ("Charlie") and nephew John B. Paine Jr. were very active butterfly and moth collectors in the Chatham area, where the family had a summer home (Paine 1991). The C. J. Paine Collection at the MCZ contains Coral Hairstreak specimens from Chatham (1920), Harwich (1920), and Yarmouth (1924), as well as Hanover (1920, 1921) in Plymouth County. On Martha's Vineyard Coral Hairstreak was collected by F. M. Jones as early as 1917 (Yale) and 1919 (BU). Many later F. M. Jones specimens are also at Yale, two dated Aug. 4, 1944. Jones and Kimball (1943) term Coral Hairstreak "fairly frequent" on the Vineyard, but "rare" on Nantucket. There are two C. W. Johnson Nantucket specimens, 1918 and 1924, at Boston University, and three in the Maria Mitchell Museum on the island: 1926 (C. W. Johnson), 1938 and 1939 (C. P. Kimball). North of Boston, Coral Hairstreak was present in Tyngsboro in 1914 (4 specimens, H. C. Fall, MCZ). At the California Academy of Sciences are two 1929 specimens from C. V. Blackburn taken in Stoneham, the future site of Middlesex Fells. There is also a 1934 Stoneham specimen from C. V. Blackburn at the Smithsonian, and 1932 and 1933 Stoneham specimens at the AMNH in New York. In the 1930's and 1940's Coral Hairstreak was collected mainly from south of Boston, at Fall River (1935, 1941, 1946, 1947, D. J. Lennox, UNH; also AMNH), Wellfleet (1944, V. Nabokov, MCZ), Wellesley (1945, V. Nabokov, MCZ), Milton (1947, H. Clench, SI), Barnstable (1949, C. P. Kimball, MCZ), and Harwichport (1957, SI). Scudder's report of Coral Hairstreak in Williamstown (Berkshire Co.) may be based on collections made while was an undergraduate at Williams College in the 1850's. In the 20th century, the earliest Berkshire County specimens appear to be three from 1957, Mt. Greylock, collector unknown, at the Maguire Center in Florida. Coral Hairstreak was further documented for the Berkshires at Richmond, 1962, O. R. Taylor (one specimen, Yale), and for Franklin County at Heath, 1981, S. D. Coe (one specimen, Yale). In addition, there are two specimens in the Berkshire Museum from Williamstown, taken 8/7/1970 by H. LaBeau, and Rene Wendell Sr. collected Coral Hairstreak in Pittsfield and Hinsdale 1980, 1983 and 1988. Through the 1950's, 1960's and 1970's there were still many Coral Hairstreaks being collected in the eastern part of the state. The more notable numbers and locations include a great many specimens from Acton 1962-1965 by C. G. Oliver (Yale); several from Ashland and Framingham in 1963 by M. G. Douglas (McGuire); Westwood and Dover specimens 1966, 1972 and 1973, W. D. Winter (MCZ); two from Edgartown Felix Neck WS in 1973 by R. E. Grey (Yale); one from Manomet Bird Observatory 1972 (MCZ); 1970 Medford [Middlesex Fells] specimens by R. Robbins (Smithsonian); and a 1975 Woburn specimen, probably Horn Pond Mountain area, R. Robbins (Smithsonian). Coral Hairstreak undoubtedly benefited from the increase in woodlots and pastures in the early agricultural era, then may have declined at the peak of deforestation in southern New England after 1850 (Table 1). Like Striped Hairstreak, it no doubt benefited again from the re-growth of young forests in abandoned fields as agriculture declined in the late 19th and early 20th centuries. But urban and dense suburban development after 1950 may be reducing numbers once again. The main host plant in Massachusetts is the black cherry tree (Prunus serotina). Elsewhere in its wide range Coral Hairstreak is reported to use also wild plum (P. americana, P. angustifolia), chokecherry (P. virginiana), domesticated plum (P. domestica), and even chokeberry (Aronia melanocarpa) (Scott 1986; Opler and Krizek 1984), but these have not been demonstrated for Massachusetts. Mello and Hansen (2004:36) suggest beach plum (P. maritima) and possibly shadbush (Amelanchier) for Cape Cod, referring to localized colonies inhabiting beach plum thickets on the outer Cape. All these plant species except P. domestica are native to and found in Massachusetts (Sorrie and Somers 1999). Scudder found a Coral Hairstreak egg on Black Cherry over 100 years ago: “the only egg I have seen was found tucked into the angle made at the extreme tip of a wild cherry twig by ...two little shoots…” (1889:813). The 1995-99 Connecticut Atlas also found eggs on P. serotina in the wild. More recent evidence for Massachusetts exists: on June 4, 2010, at night, photographer Sam Jaffe found a large, colorful Coral Hairstreak caterpillar actively feeding at the upper tip of a trail-side black cherry sapling on Great Blue Hill in Canton. Ten to fifteen ants were swarming all over it. Apparently these caterpillars spend the day in the leaf litter and only emerge at night to feed, attended by ants. (Jaffe, masslep 6/5/2010; photo showing ant at http://www.pbase.com/spjaffe/image/125237720). The Coral Hairstreak egg is usually laid at the base of the tree, either on bark or sometimes in adjacent leaf litter. The egg overwinters, and hatches in spring, just as the new leaves emerge. The larvae feed on the new leaves and flowers of the cherry. As with most hairstreaks, the larvae are tended by ants, which feed on the honeydew secreted by the larvae (Allen 1997:82; Connecticut Atlas 2007). As mentioned, Coral Hairstreak's habitat is early successional forests where Black Cherry is a common pioneer species. Nearby open area nectar sources are also needed, as well as the presence of the proper species of ants. Scudder (1889) says Coral Hairstreak “…frequents blossoms, especially those of goldenrod, Jersey tea, milkweed, and thistle;” many butterfly observers today can confirm this list of nectar sources, and add dogbane and clovers. Both MBC 2000-2007 reports and the 1986-90 Atlas rank Coral Hairstreak as an “Uncommon” butterfly (Table 5). In MBC reports it was less common than Banded Hairstreak or Edwards' Hairstreak, but about on a par with Striped Hairstreak. MBC records suggest that this species' population may be declining somewhat (Chart 17). List-length analysis of these records 1992-2010 similarly found a statistically significant decline of 65% in Coral Hairstreak detection (Breed, Stichter, Crone 2012). Chart 17 details this overall decline, but the result is greatly dependent on particularly large and possibly atypical numbers reported in 1992 and 1993. After 1993, between 1994 and 2009, Coral Hairstreak reports per total trips showed a rather consistent pattern of yearly ups and downs, and in fact an upward trend in the years 2006 through 2009. A modest increase in Coral Hairstreaks in 2007, 2008, and 2009 is also indicated by a measure which omits the years 1992 and 1993. In 2007 the average number of Coral Hairstreaks per report of that species increased 65%, in 2008 110%, and in 2009 106%, compared to the average for preceding years back to 1994. The maximum number reported in any one report also increased in 2007, 2008, and 2009 relative to prior years, although the actual number of reports of this species fluctuated (Nielsen, Season Summary, Massachusetts Butterflies 2008-2010, Nos. 30, 32, 34). 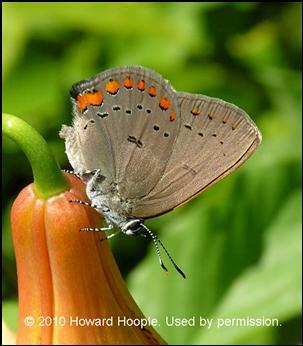 Coral Hairstreak is found statewide. 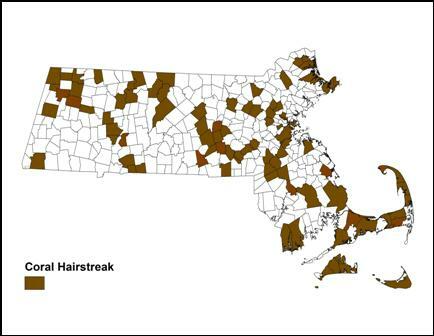 In 1992-2013 it was reported from 88 of the 351 town in Massachusetts (Map 17). It is less common in the rich mesic forested areas of western Massachusetts, and most common on the coastal plain, especially on Cape Cod and Martha’s Vineyard. The Atlas found Coral Hairstreak relatively scarce in the Berkshires and along the northern border. Map 17 of MBC sightings shows all towns from which there is even one report. It shows that Coral Hairstreak has been found throughout the Berkshires (usually on the NABA Counts) and in many northern border towns. But NABA count data suggest, as the Atlas did, that this species is much more abundant in southeastern Massachusetts, the Cape and the Vineyard. On the NABA Counts, the largest numbers are usually reported from the Foxboro, Blackstone Valley, Martha’s Vineyard, Falmouth, and Truro (Outer Cape) counts--- but also from the Central Franklin count. Lower numbers are consistently reported from the Northern and Southern Berkshire Counts. Mello and Hansen (2004: 36) say that Coral Hairstreak is “widespread across Cape Cod,” although “not seen in large numbers.” The Martha's Vineyard checklist (Pelikan 2002) ranks it as Uncommon, along with Banded and Striped Hairstreaks, in comparison to Edwards’ Hairstreak, which is Common there. For Nantucket, BOM-MBC records, the Atlas, and older museum specimens confirm Coral Hairstreak’s presence, but the numbers appear to be low. The only recent report is a single individual photographed by E. LoPresti on 8/21/2011. With recent increases in the growth of black cherry on the island, the numbers seen there may increase ( LoPresti 2011). At single locations, such as a field or a wildlife sanctuary, Coral Hairstreaks are usually seen only in small numbers, but there are occasional concentrations. In eastern Massachusetts one of the most productive locations has been Wellfleet Bay Sanctuary, with 24 reported on 7/10/2013 on butterfly weed flowers, and 27 reported on 7/19/2008 (both, M. Faherty). Other notable locations have been Sandwich Mass. Military Res. (normally closed to public; 58, 7/16/2011, E. Nielsen); Canton Great Blue Hill (17, 7/24/2005 E. Nielsen), Woburn Horn Pond Mountain (8, 7/4/2011, D. Amadio), and North Andover Weir Hill TTOR (8, 7/6/2013, H. Hoople). In western Massachusetts, a very productive spot has been Windsor Moran WMA (32, 12 on one milkweed clump, 7/9/2011, B. Benner). Coral Hairstreak has one brood each year. MBC 1993-2008 records indicate a flight period from the beginning of July through mid-August, with the greatest numbers seen the first three weeks of July ( http://www.naba.org/chapters/nabambc/flight-dates-chart.asp ). Flight Advancement: A century ago, Samuel Scudder wrote that Coral Hairstreak first emerged as an adult "shortly before the middle of July" (1899: 814). Scudder's dates usually referred to the latitude of Boston, and if that is true in this case, today's flight dates would appear to have advanced significantly over the last one hundred years. Evidence demonstrating this flight advancement comes from a 2012 study at Boston University, which combined museum, Atlas, and MBC data to find that Coral Hairstreak is flying 0.1 days per year earlier (p<0.001) over the 114-year period 1895 to 2009. It has also significantly advanced its flight date (first 20% of sightings) during more recent years, as shown in Graph 17 (p=0.0119; graph courtesy of Caroline Polgar). Over the 24 years shown, it has changed (advanced) its flight date -1.63 days for every change (advance) in ºC in average May and June temperatures (Polgar, Primack et al. 2013). Calculations with more recent data, 1986-2012, showed that Coral Hairstreak advanced its reported flight date even more over this period (Williams et al., 2014). The years 2010, 2011 and 2012 had particularly early sightings. In the Polgar/Primack study, Coral Hairstreak, and to a lesser extent Edwards' Hairstreak showed significant advancement in flight time in recent years, but the degree of flight advancement was not as great as that shown by two common elfins, Brown Elfin and Eastern Pine Elfin. However, nearly all elfins and hairstreaks studied showed significant response to temperature variations in the preceding two months before emergence, varying their flight time according to average temperature. This responsiveness to temperature is an adaptive trait. Earliest Sightings: In the 23-year period 1991-2013, the six earliest "first sighting" dates in BOM-MBC records are 6/21/2010 Woburn Horn Pond Mountain R. and S. Cloutier; 6/23/2012 Woburn Horn Pond Mountain S. Moore et al., and 6/26/2011 Canton Great Blue Hill, M. Arey (also 6/26/1999 Mansfield T. Dodd); 6/27/2009 Woburn Horn Pond Mountain E Nielsen et al. ; 7/1/2000 Easton/Sharon T. Dodd; and 7/2/1994 Worcester T. Dodd. The 7/2/1994 observation had been reported as the Atlas early date, so MBC data push forward the known early flight date. All these dates are earlier than Scudder's "slightly before the middle of July." Flight Peak: The peak flight time for this species has also advanced. Peak numbers are now seen during the first three weeks of July, after which numbers begin to taper off (MBC flight chart). This peak is earlier than that reported at the turn of the century by Scudder (1889: 814), who says that “the period of its earliest abundance is the last of July and the first of August.” The peak in MBC sightings is also earlier than the ‘mid-July-early August’ peak reported in the Atlas period. However, MBC data may be somewhat distorted by the concentration of the NABA Counts in July. Latest Sightings: Although the beginning of the flight period has advanced since Scudder's day, no change can be seen in the tail of the flight period. Scudder said that Coral Hairstreak "continues upon the wing until nearly the last of August" (1899: 814), and that is certainly still the case today, although perhaps not in every year. In the 23 years 1991-2013, the five latest dates in BOM-MBC records are 8/23/1997 West Tisbury, M. Pelikan; 8/21/2011 Nantucket E. LoPresti, photo; 8/19/1995 Holden, T. Dodd; 8/18/2003 Wellfleet M. Faherty; and 8/13/1994 Truro, T. Hansen. The Atlas late date had been similar, 8/22/1990 Edgartown, B. Cassie. The earliest Coral Hairstreak dates occur more often inland, while the latest dates occur more often on the Cape and the Islands. As Chris Leahy pointed out in the MAS Atlas, Coral Hairstreak does not benefit from the maturing of dense forests which is occurring today in some areas. It needs early successional habitat, formed, for example, when land which was cleared during the 18th and 19th centuries was then allowed to revert to forest (cf. Gochfeld and Burger 1997:148). Today, two forces decrease our open field and early successional habitat: dense urban and suburban development on the one hand, and the maturing of dense forests on the other. Coral Hairstreak has a wide range which extends into higher-elevation areas of southeastern United States, and west through the eastern Great Plains. It should prove adaptable to earlier spring temperatures, and may avoid being negatively affected by climate warming in Massachusetts. (For species which may be negatively affected by climate warming here, see Table 6, as well as Breed et al. 2012.) If Coral Hairstreak is declining in this state, habitat loss is a more likely cause than climate change. It is not known whether Coral Hairstreaks disperse long distances; other hairstreaks usually form quite localized colonies around larval host plants and do not wander far. Thus, ‘element occurrences’ need to include nearby nectar sites as well as breeding areas. Presence of particular ant species may be important. But Coral Hairsreak's host plant(s) and habitat are still fairly common in Massachusetts, and NatureServe (2010) ranks Coral Hairstreak as S4 or “apparently secure” in this state.